Do you have a nice piano? 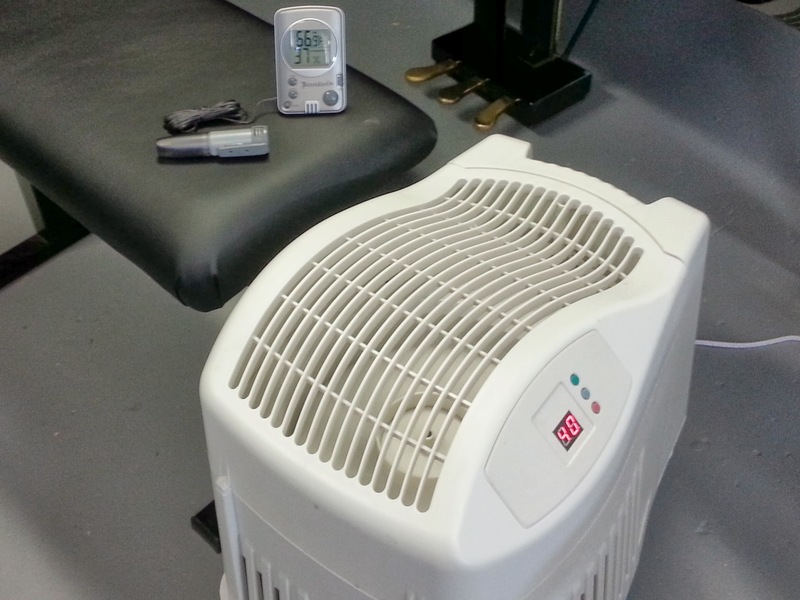 Then you must have these: a good room humidifier with a large tank (at least one) and at least 2 hygrometers. Two hygrometers are needed because they will not read the same and you need to act on the average. Place them in different parts of the room to make sure the room has even humidity levels. The humidifier shown is from Sears and is actually quite good. It has a large tank and an auto setting as well as 4 manual fan speeds. You can add humidity in a hurry with this beast. The tank is removable making it easier to fill but your sink has to be big enough. The little USB thing is a data logger. It measures temperature and humidity every hour for a period of time..up to a year. You download the data to your computer every so often and can see what happens when you’re not there. Sort of like a nanny-cam for your environment. Soundboards are thin and very sensitive to swings in humidity. Controlling both the high and low levels is best, keeping it between, say 30% and 60%. Most homes have air conditioning now which is an effective dehumidifier, so summers are usually not the problem. But most heating systems remove humidity, particularly in the midwest and northeast. This is dangerous, only if you care about not having your soundboard crack. If you don’t care, carry on but don’t complain to me or think for a moment that it is a warranty problem. Keep the humidity above 30% and everything will be fine. It can drop below 30% for an hour or a day and you’ll still be fine, wood does not loose moisture that quickly. But if you’re going away on vacation, have somebody check the mail, feed (and pet) the cat and fill the humidifiers. JUST DO IT! I’ve heard it all before…”I have a system on the furnace”, “we have plants”, “it never gets that dry, I can feel it”. Ya? Well prove it. Get the hygrometers and look at them multiple times a day. If it is ALWAYS above 30%, I will publicly say you are right and that I told you to do something that you didn’t have to do. But it is highly unlikely I will have to do that. There is a system designed to be mounted in a piano. Called a Dampp Chaser or a Piano Lifesaver System, it is quite effective and will be covered in a separate post.